Corticobasal degeneration (CBD) is a distinct neurodegenerative disorder characterized by widespread neuronal and glial accumulation of abnormally phosphorylated tau protein. Patients with CBD often present with corticobasal syndrome (CBS) showing impairment of the motor system, cognition, or both. Several studies demonstrate that they may also present with progressive supranuclear palsy syndrome (PSPS), aphasia, Alzheimer disease-like dementia, or behavioral changes, suggesting that CBS is merely one of the presenting phenotypes of CBD. Accurate diagnosis is important for future clinical trials using drugs aimed at modifying the underlying tau pathology. 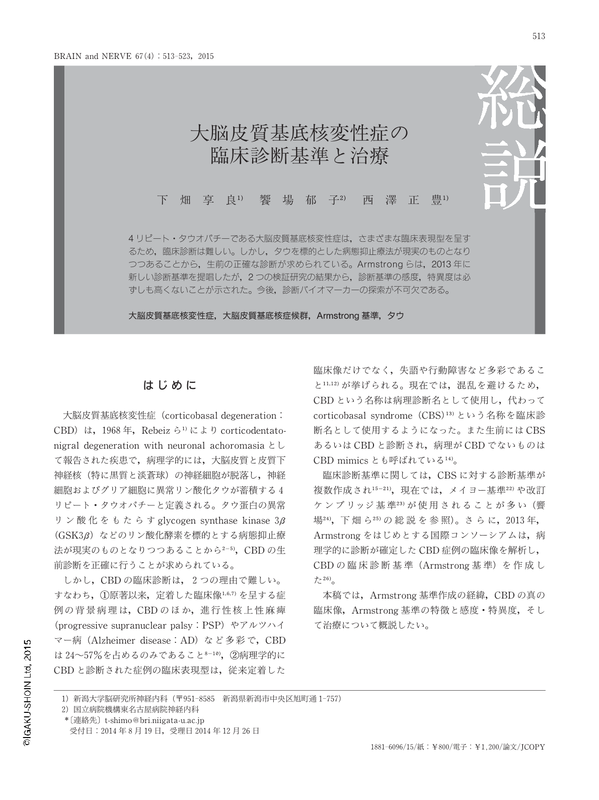 Although previous CBD diagnostic criteria reflected only CBS, Armstrong et al. proposed new diagnostic criteria for CBD in 2013 (Armstrong's criteria). The new criteria include 4 CBD phenotypes, including CBS, frontal behavioral-spatial syndrome (FBS), nonfluent/agrammatic variant of primary progressive aphasia (naPPA), and PSPS. These phenotypes were combined to create 2 sets of criteria: specific clinical research criteria for probable CBD (cr-CBD) and broader criteria for possible CBD that are more inclusive but have a higher probability of detecting other tau-based pathologies (p-CBD). However, two recent studies revealed that the sensitivity and specificity of these criteria were insufficient. Further refinement of the criteria is needed via biomarker research with prospective study designs. Copyright © 2015, Igaku-Shoin Ltd. All rights reserved.